This lesser dose vitamin is suited for everyday users, while the double strength variety is better suited for those suffering from recurrent cold sores or other concerns. L-Lysine is an essential amino acid that must be obtained through the diet or through supplementation. 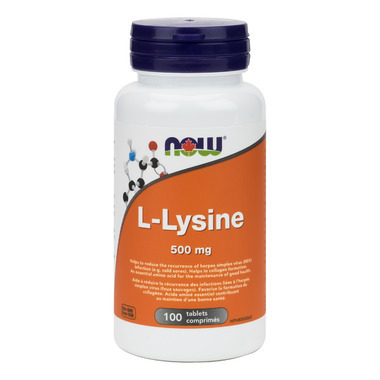 Lysine is necessary for the production of all proteins in the body, and is required for the maintenance of the structural proteins collagen and elastin, which form all connective tissue such as skin, tendon, and bone. L-Lysine supports a healthy immune system which in turn helps to fight cold sores. In addition, L-Lysine is also a precursor to L-carnitine, which is needed for fat metabolism and energy production, which can support good health. Tablet delivery avoids a gelatin capsule and provides a vegetarian / vegan option. Other Ingredients: Cellulose, Silica, Magnesium Stearate (vegetable source) and Tablet Coating (hypromellose, stearic acid, cellulose). At the advice from his doctor, my husband takes L-Lysine at the very first signs of a cold sore and then continues to take it a couple times a day for a few days. My husband swears it makes a huge difference, which says a lot as he isn't usually the type to take medications or supplements (he'll even suffer through a headache rather than take a couple of Tylenol).